You can enjoy much more than plants in your garden every evening and into the night, and in fact the right accessories can beautifully enhance your garden even as twilight falls. Consider these stunning accessories and accents to turn your daytime garden into a nighttime paradise. Let gentle evening summer breezes play soothing sounds in your garden or patio. Choose from Bamboo styles or traditional wind chimes, and try different sizes and styles to find the tinkling tones you like best. 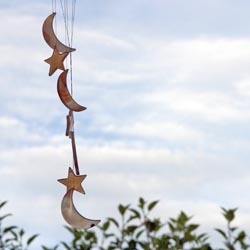 Avoid using too many wind chimes, however, as different styles can have contrasting tones that may clash with one another rather than create a soothing melody. Light up the night with lovely candleholders, lanterns and decorative torches to keep your summer evenings long and bright. Place appropriate lighting along pathways, deck edges and stairs to safely illuminate gathering areas, or use spotlights to create dramatically uplit trees and shrubs. For a whimsical touch, try kitschy strings of themed lights for a fun accent, or add elegance with multiple lanterns suspended from a large tree. Erase your daily pressures by bringing the soothing, relaxing sounds of water to your patio or deck. A handcrafted tabletop fountain will add a soft, natural sound in harmony with your evening of relaxation. Consider fountains that may double as bird baths or centerpieces to do double duty during the daytime as well. 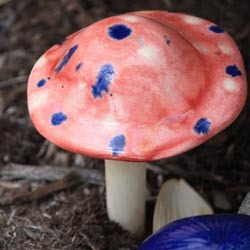 Add enchantment to your garden with magical Tinkling Toadstools. When placed in groups, colorful glazed caps create a tinkling sound when the wind blows. Position them under a shrub or in a large, rustic container to add a fairy garden ambiance to your evening landscape, and be sure there is subtle light nearby to highlight their color and beauty. When the moonlight, candles and twinkle lights reflect on the water’s surface, there is an added glow and iridescence to the garden. Running water from a re-circulating pump powering a small spray fountain or waterfall provides a relaxing background sounds to the summer evening. Accent your water feature with floating lights, stunning water lilies or other creative options. Add nighttime beauty to ponds, fountains, statuary, landscaping and more with Cal Pump’s Egglite. These assorted colored, 10-watt lights are compact spot lights that can be used in or out of the water and are suitable for fresh, salt or chlorinated water. Position them unobtrusively and select colors that can magically enhance your nighttime landscaping. With the right evening accents, you don’t have to stop enjoying your garden when the sun sets – just as temperatures cool off, the beauty of your garden can be heating up.